We manufacture ELISA kits for measurement of methoxy-PEG and non-methoxy-PEG (free and conjugated) as well as ELISA kits for detection of anti-PEG IgM and IgG in mouse, rat and monkey serum or plasma. PEG coated plates and blocking buffers are available for those interested in developing their own PEG assays. Researchers should be aware that many commercially available ELISA buffers contain Tween-20 or other polyoxyethylene detergents that significantly interfere with PEG assays. Our blocking buffer is devoid of polyoxyethylene detergents and can be used to block and stabilize plates coated with PEGylated proteins or PEG antibodies. 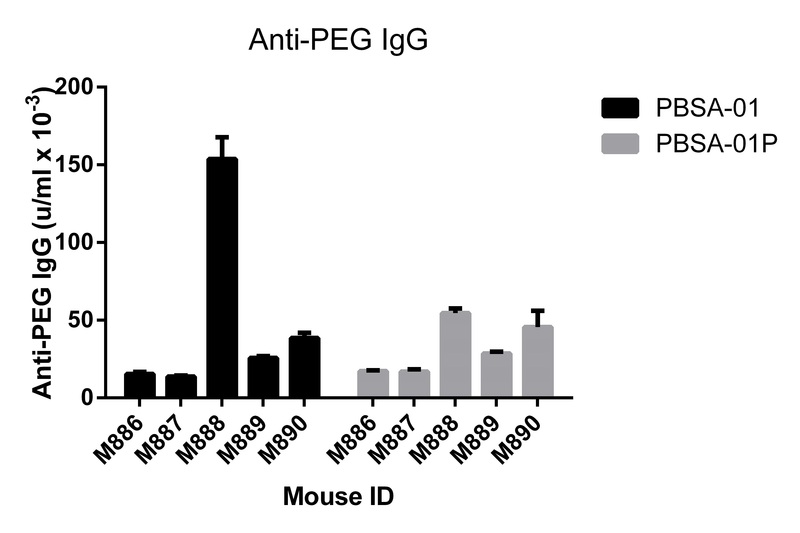 The figures below illustrate the use of our mouse anti-PEG IgG and IgM ELISA kits. Mice were immunized with mPEG-KLH (n = 5 for each study). Serum samples collected on days 7 and 25 were used for evaluation of anti-PEG IgM and IgG respectively. Antibody levels were evaluated using microtiter plates coated with (i) methoxy-PEG-BSA (PBSA-01) and (ii) a comparable non-methoxy PEG-BSA, in which the terminal methoxy group was replaced by a pentanoic acid group (PBSA-01P). Comparison of reactivity on the two plates allowed assessment of antibodies directed against the terminal methoxy group as well as the PEG backbone. 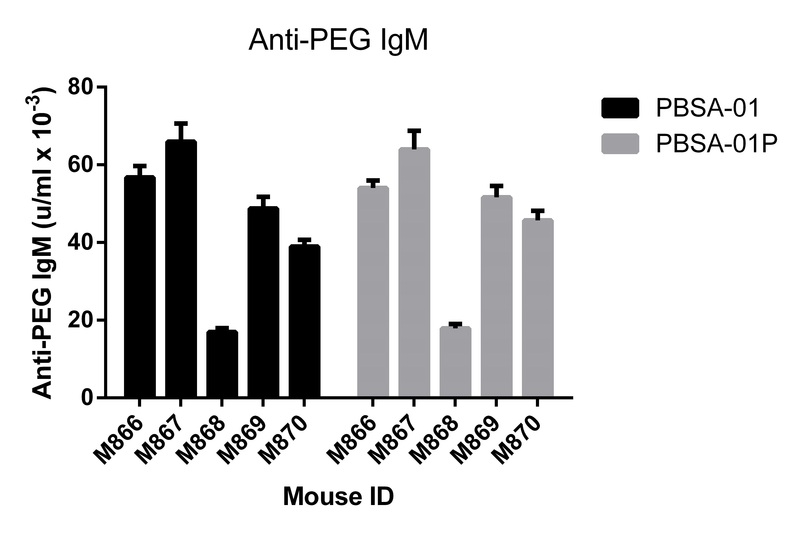 As can be seen, in the IgM study (upper figure), serum from all five mice gave identical reactivities against methoxy and non-methoxy PEG-BSA, indicating that all mice produced IgM antibodies directed against the PEG backbone. 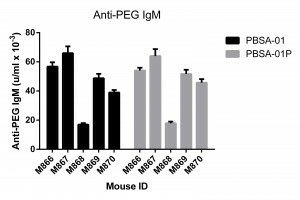 In the IgG study (lower figure), four of the five mice gave identical reactivities against both PEG antigens, again indicating that all antibodies produced by those mice were directed against the PEG-backbone. 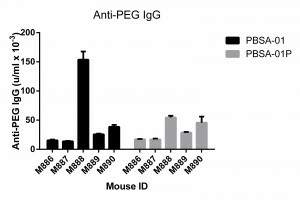 However, one mouse (M888) had a 3-fold greater reactivity against methoxy-PEG BSA, indicating a predominant antibody response against the terminal methoxy group. Please note that our anti-PEG ELISA kits (listed above) are provided with methoxy-PEG coated plates. non-methoxy PEG coated plates are available on request.